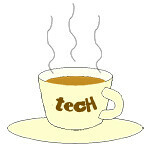 image editor « Tech bytes for tea? 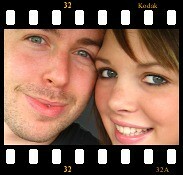 Use GIMP to turn photos into film slides and then join them together into a film strip. The most straightforward way of conveying recording motion is to shoot video. 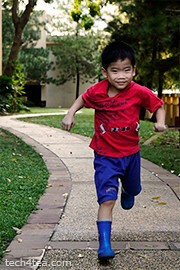 However, photos can also be used to convey a sense of motion. One way is to use a fast shuttle speed to freeze motion. Usually the posture of a sprinting man or the midair position of a mountain bike tells a story someone or something in motion frozen in that split second of exposure. The other way is to do a panning shot. The photographer uses a relatively slower shuttle speed and moves camera such that the moving subject is kept at within the same location in the viewfinder. This is much trickier but the results can be dramatic. Only the moving subject is in focus while the surrounding background is blurred in motion blur. This effect can sometimes be simulated using a photo editor. Yet another way is to shoot a sequence of photos of the moving subject. The photos in the sequence show the moving subject at various stages of movement. 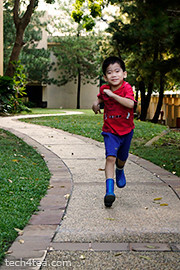 Many compact cameras today feature a burst mode for shooting action. Once the camera is focused on the moving subject, press down the shuttle release button and hold it down. The camera shoots in rapid succession a series of shots of the moving subject. Last week, we saw how the Slide filter in GIMP can modify a digital photo to make it look as if it is mounted onto a film slide. To make a film strip, simply apply the Slide filter separately to each photo in the sequence, and then join them together into a single film strip. Photos in landscape orientation will result in a horizontal film strip while photos in portrait orientation will result in a vertical film strip. All the photos in the sequence should be of the same size, so that they can be joined together seamlessly. When the Slide filter is applied to a photo, the resulting photo that with the slide frame comprises three layers: the original photo (cropped to 3:2 aspect ratio), the slide frame (with the sprocket holes and the text labels), and a coloured background (which shows through the, the sprocket holes of the slide frame). Use the Image > Flatten Image command from the main menu to flatten the layers into a single layer to make it easier to drag and transfer it to another image window. After each of the film slides have been flattened, drag and drop each of them the image window containing one of the film slides. This will become the workspace for joining the separate film slides into a single film strip. Select the Image > Canvas Size command from the main menu. A “Set Image Canvas Size” dialog box pops up. First click the chain link between the Width and Height text fields so that one value can be changed independently of the other. If the film strip is to be horizontal, increase the Width, if the film strip is to be vertical, increase the Height. To save the trouble of doing manual calculations, change the units in the dropdown box from “pixels” to “percent”. Then change the Width or Height field to the appropriate multiple: if there are to be two photos in the film strip, increase from 100 to 200 percent; if there are to be three photos, increase to 300 percent. Press the “Resize” button to confirm the change. The image window shows only one of the film slides, the others are hidden directly below it. Select the Move Tool in the Toolbox. Drag the top film slide to move it. Hold down the Ctrl key on the keyboard while dragging to constrain the movement of the film slide to strictly horizontal or vertical movements. Drag the film slides until they are positioned end-to-end with each other, and forms a horizontal or vertical film strip. You can use the arrow keys on the keyboard to nudge the film slides so that the edges are seamless and doesn’t show any gaps in between. 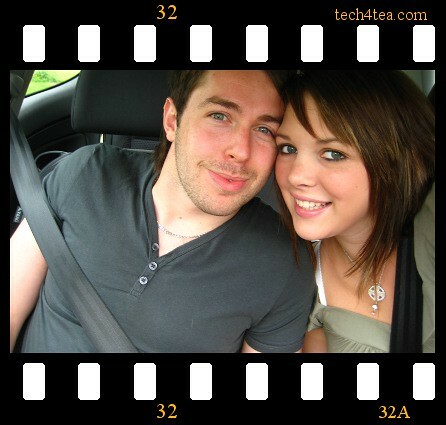 Save the file and you have your film strip. 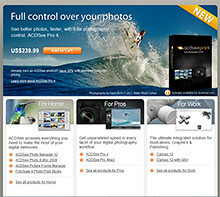 Seattle based ACD Systems announced the availability of the latest version of its all-in-one photo editing and management product. 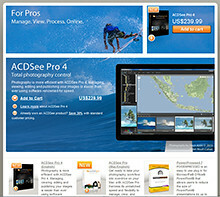 The US$239.99 ACDSee Pro 4 promises to reduce time, cost and complexity for the professional photographer. Pro 4 gives photographers the freedom to organize photos and their digital workspace according to their individual needs and preferences. They can customize their application toolbars and layout to reflect the way they naturally work with their images—Manage, View, Process and publish Online. Photographers can view and manage a wide range of file types. 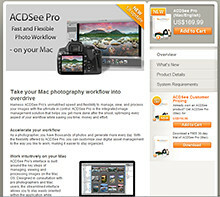 ACDSee’s catalog-based technology stores key identifying metadata for each image, including date, location, and equipment used. This makes it fast and simple to perform tasks such as search according to keywords, dates and other important information, and to drag and drop images to compare characteristics and tags with other images. Photographers do not have to import or export images into a vendor-controlled database resulting in a virtual view. Unlike other solutions, Pro 4 allows users to edit photographs in real-time, directly from the source – whether it is a camera memory card, hard drive or computer system — and then save those changes to the original equipment. The patent-pending LCE (Lighting and Contrast Enhancement) and single exposure HDR (High Dynamic Range) algorithms are built into Pro 4’s RAW technology. The technology was developed to give users a simple and efficient means of dramatically improving lighting and contrast in photos. Photos are fine-tuned to more accurately reflect the subject, and if desired, enhance the representation of the original subject. 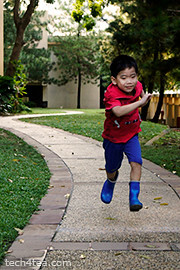 With LCE, photographers can increase the exposure of dark (underexposed) photos, increase the contrast and vibrancy of dull photos, correct uneven lighting, correct backlit photos, selectively brighten dark areas and darken bright areas (automatic dodge and burn), and create an HDR image from a single exposure. Original RAW images are rendered in full-size and at high speed. Lighting and exposure problems, including high contrast and backlit scenes, insufficient flash, dull images, and under and overexposure are corrected in seconds. 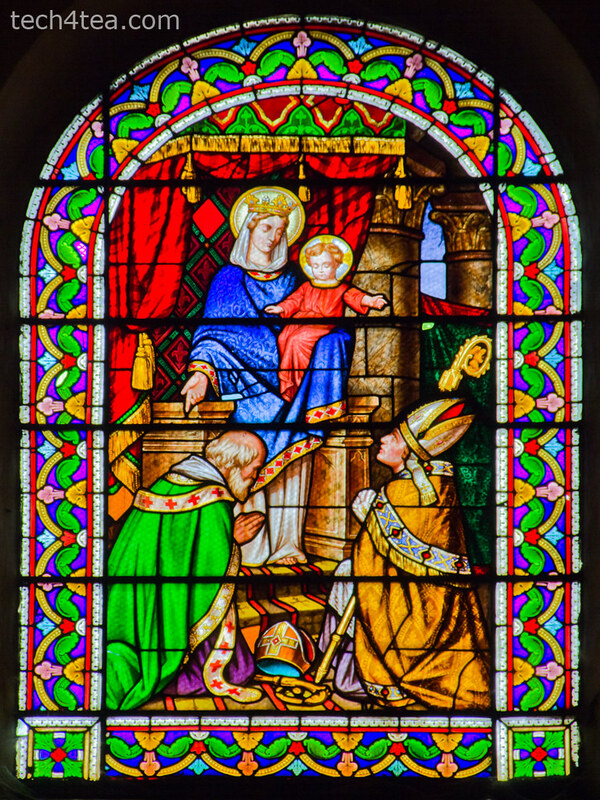 The traditional alternative – multi-exposure HDR – is extremely labor intensive and requires additional, specialized software. It can also result in motion blur, as well as process and capture complexity. Edits can be seen in real-time and previewed in full screen. Batch processing is intuitive and fast. Photographers can experiment freely, knowing that the originals are always safe with Pro 4’s non-destructive editing capabilities. Photographers can use his own editing tool together with Pro 4. For example, they can use editing products such as Photoshop and then import their images into Pro 4 for management and distribution. 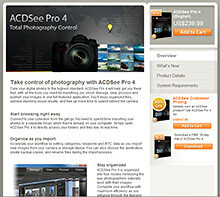 Photographers can quickly and easily share photographs using ACDSeeonline.com, a free, cloud-based photo sharing site. Privacy controls are set by the photographer, to ensure control and security. Pro 4 allows selected contacts to download password protected full resolution images. Photographers can also share images on the most popular social media sites such as Facebook, Twitter, Flickr, SmugMug and Zenfolio, and/or via their own websites. Tired of simple white borders for your digital photos? GIMP has a simple filter that adds a frame around the photo to make it look like it is a film slide – complete with black frame, sprocket holes, and labels. Turn your digital photo into a film slide using the Slide filter in GIMP. Adding a border around a digital photo adds visual interest to make it look more interesting, and can focus the viewer’s attention on the main subject as well. 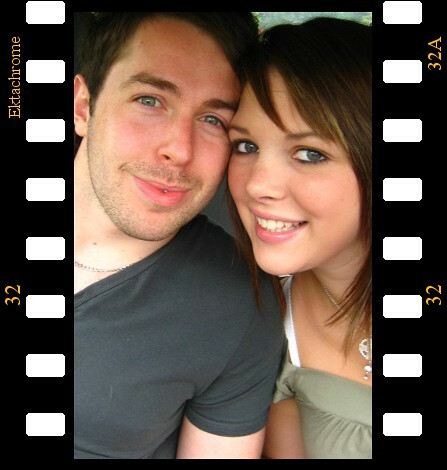 If you’re feeling fanciful, you can easily add a decorative border around your photo to turn it into a film slide. Here’s how. The original photo in landscape orientation. Photo from morguefile.com. With your photo open in GIMP, select the Filters > Decor > Slide command from the main menu. The pop-up dialog box for the Slide filter. The “Slide” dialog box for the filter pops up with various options to customise the appearance of the slide. The Slide filter can also be applied to a photo in portrait orientation. The “Text” option allows you to enter a label for the slide. You can use it to caption your photo. Or you could type in “Kodak” to emulate a real slide. For “Number”, type a number from 1 to 37. 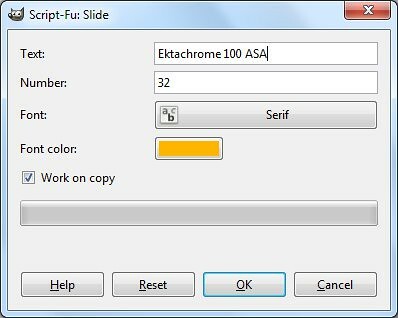 The “Font” and “Font color” options lets you specify the font face and colour of the text and numbers adorning the slides of the slide. Leaving them to the default values produces the most realistic results. Leave the “Work on copy” option checked so that a duplicate copy of the photo will be used for the slide effect and the original is left unchanged. Press the “OK” button and GIMP churns out your slide as a new image which you can save as a JPEG file under a different name. If the original photo is in landscape orientation, the black frames with sprocket holes and labels will be added to the top and bottom sides of the photo. If the original photo is in portrait orientation, the frames will be added to the left and right sides. The colour of the sprocket holes will be based on the current background colour in the colour swatches in the Toolbox. So if you want the holes to be white, remember to reset the background colour to white by pressing “D” on the keyboard, before applying the filter. If the aspect ratio of the photo is anything other than 3:2, it will be cropped into that ratio. If you want to control exactly how the photo is to be cropped, crop it yourself to 3:2 first before applying the filter. 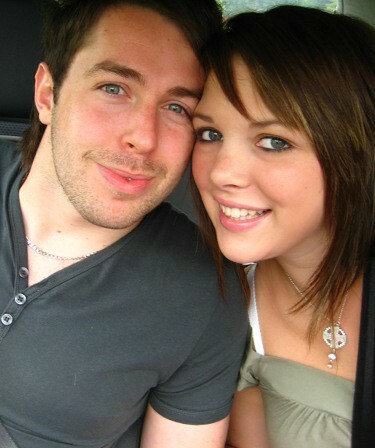 This will ensure you don’t end up with half a face being cropped out of the photo. Letting the filter crop to 3:2 aspect ratio may have a blinding effect. Use the crop tool to do your own cropping to crop it exactly the way you want it. Did you see the front page of The Sunday Times on 15 May? 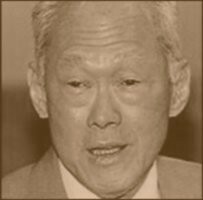 The portraits of MM Lee and SM Lee were splashed across half the front page in sepia – that faded brown tint that adds a sense of nostalgia to photos because of the association of that toning effect with photographic print techniques from a bygone era. Old Photo filter in GIMP applied with Defocus and Sepia options selected but without Mottle nor faded border effect. 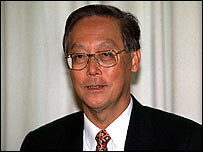 Minister Mentor Lee Kuan Yew and Senior Minister Goh Chok Tong are two former Prime Ministers of Singapore who had tendered their resignations on Saturday, May 14 to quit the Cabinet – in order to make way for a clean slate for the current Prime Minister Lee Hsien Loong to reform the ruling PAP government. Old Photo filter in GIMP applied with Defocus, Sepia and Mottle options selected together with faded border effect. The first and second Prime Ministers of the island nation, both brought Singapore from a fledgling, newly-independent, former-colonial state barely able to survive – to the modern nation it is today. Despite handing over their Prime Ministership to their successors, both had been actively involved in the government. So it was surprising to see, so soon and suddenly, both their portraits published in sepia – suggesting they have become part of a bygone era. “Beginning in the 1880s, sepia was produced by adding a pigment, called sepia, made from the Sepia officinalis cuttlefish found in the English channel,to the positive print of a photograph,” according to Wikipedia. The specialized treatment gave the photograph a warmer tone and enhanced the archival qualities of the prints. 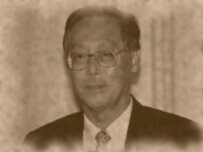 It is easy to simulate a sepia effect to a digital photo using photo-editing software. 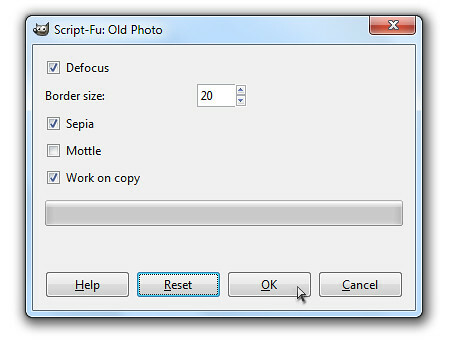 In GIMP, open the digital photo to be modified and select the Filters > Decor > Old Photo command from the main menu. 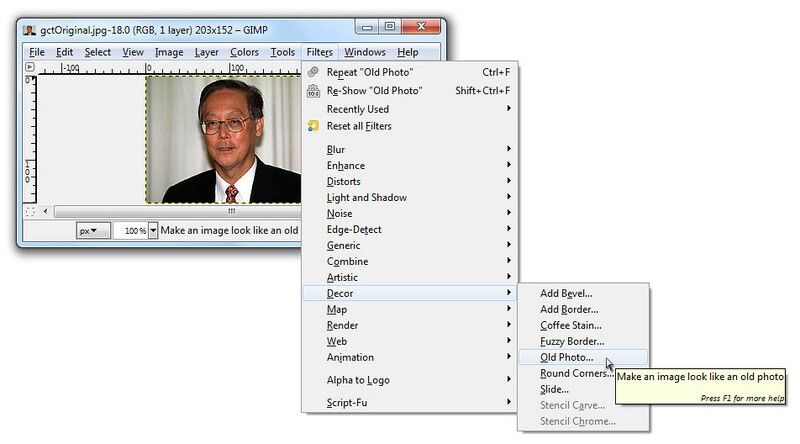 The “Old Photo” dialog box pops up with options to control how the photo is to be “aged”. The Old Photo filter comes with options to age the look of a photo. You can “Defocus” the photo to make it slightly blur, add a faded white border, apply a “Sepia” tone, or “Mottle” the photo to simulate the blobs of pigment you see in old photos. 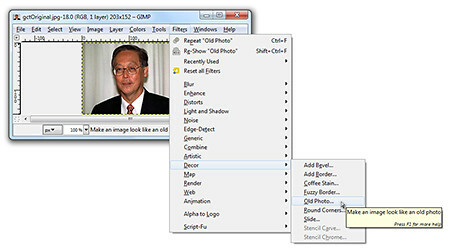 Checking the “Sepia” checkbox will tell GIMP to desaturate the image, reduce brightness and contrast, and modify the color balance to apply the sepia effect. Once you click “OK”, GIMP gets to work on the photo. If you just want to get a black-and-white version of the photo, or tint in a different colour from sepia, or want more control over how the final result looks like, check out the “Black-and-white and Sepia” tutorial that was part of the 14-part Basic GIMP Series of tutorials. Both the rudimentary Brightness-Contrast command and the handy Levels command allows you to enhance the tonal balance of a photo and for correcting colour balance. But the Curves command gives you ultimate control over how specific tones are to be tweaked in your digital photo. The Levels command allows the user to adjust the three main tonal ranges of a photo – the shadows, midtones and highlights. The Curves tool, however, allows you to target any tone or tonal range in the photo to tweak their brightness and contrast. With the photo open in GIMP, choose the Colors > Curves command (or Tools > Color Tools > Curves) from the main menu. An “Adjust Color Curves” dialog box pops up showing a square grid with a straight diagonal line. The histogram of the photo can be seen in the background of the grid for reference. 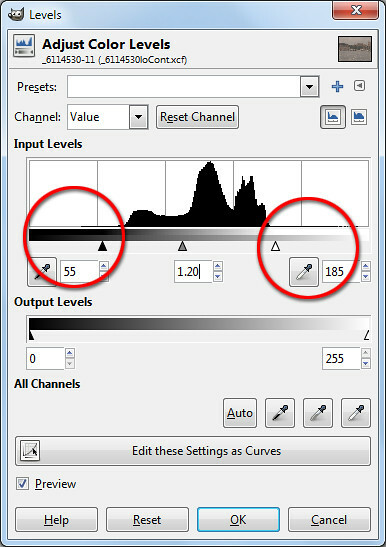 As for the Levels command, an understanding and analysis of the histogram of the photo is the basis for using the Curves command. The horizontal X-axis of the grid represents the initial brightness values – from zero (black) to 255 (white) – of the pixels in the photo before the Curves command is applied. The vertical Y-axis represents the brightness values that each pixel is to be mapped into after the adjustments have been applied. It also ranges from zero to 255. The lower left corner of the grid represents the black point (for pixels with brightness value zero) while the upper right corner represents the white point (for pixels with the maximum brightness value of 255). To begin adjusting the photo, click anywhere on the diagonal line in the grid. An anchor point is added to the line. You can drag the anchor point around with the mouse. Drag the point downwards to make the photo darker. The straight diagonal line turns into a curve passing through the anchor point and the black and white points. A faint straight diagonal line is still visible in the grid – it serves as reference for an unadjusted photo. When the cursor is inside the grid, you can see the X (input) and Y (output) values of the cursor at the top left hand corner of the grid. Mouse-over the anchor point that you’ve just dragged. In the example, you can see that the brightness of any pixel with original value 128 (X-value) will be reduced to 160 (Y-value). Pixels with brightness close to 128 will also be darkened. You can eyeball the effects of the adjustments by looking at the photo itself in the image window. To lighten the photo, drag the anchor point down below the faint diagonal guide. Now pixels with brightness 128 will be darkened to 90, while the pixels of similar brightness will be darkened as well. To remove an anchor point, simply drag it off the side of the grid. You can add as many as 14 anchor points (excluding the original black and white points) to the curve. This allows you to target up to 16 specific brightness values in the photo for brightening or darkening. However, you seldom need more than a handful anchor points to get the job done. 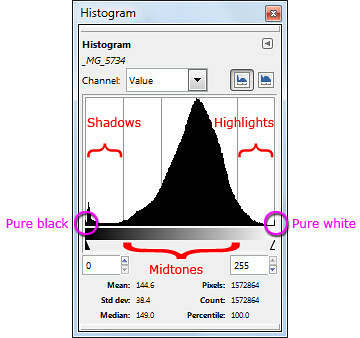 If the histogram is bunched up the towards the middle, drag the black or points inwards horizontally to where the histogram begins and ends respectively. This is similar to dragging the black and white points of the Levels command inwards to maximise the tonal range of the photo. The steeper gradient of the line indicates that the contrast of the photo is increased. A typical Curves adjustment that can be applied to most photos is the “S-Curve”. This curve tends to enhance most photos by increasing the overall contrast and making the photo “pop” with vivid shadows and highlights. 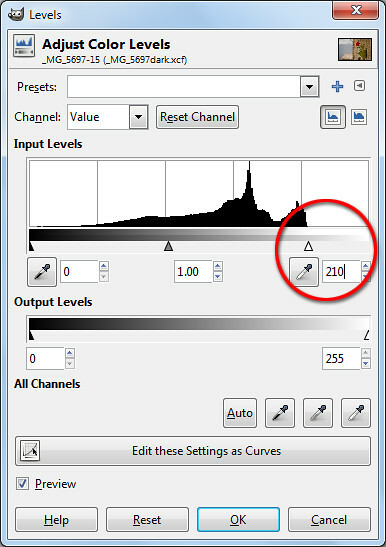 To apply an “S-Curve” adjustment, add two points on the Curve – the first to lower the brightness of pixels of brightness 64, the second to increase the brightness of pixels of brightness 192. The above numbers are just guides – drag the adjustment points around with the mouse while eyeballing the photo. The S-Curve suppresses the shadows and highlights while increasing the contrast of the mid-tones, where the main subject usually is. Add a third point with brightness of roughly 128 to increase or decrease the brightness of the midtones. In addition to these adjustment points, you can add additional adjustment points to tweak specific tones in the photo – such as skin tones. With some practice, you will be able to control and enhance any particular tone that appears in your photo. The final installment of the 14-part Intermediate GIMP series will be run next weekend. After more than a week of following the Singapore General Election 2011 and staying up past 3 am to watch the results, I’m afraid I’ve had to postpone the final installment of the Intermediate GIMP series till next weekend. It will be on using the advanced Curves command to correct/enhance the brightness and contrast of a photo. The Levels command is the tool of choice for more advanced users of photo editors for enhancing the tonal balance of a photo and for correcting colour balance. That’s because it offers better control than the rudimentary Brightness-Contrast command and produces much better results. 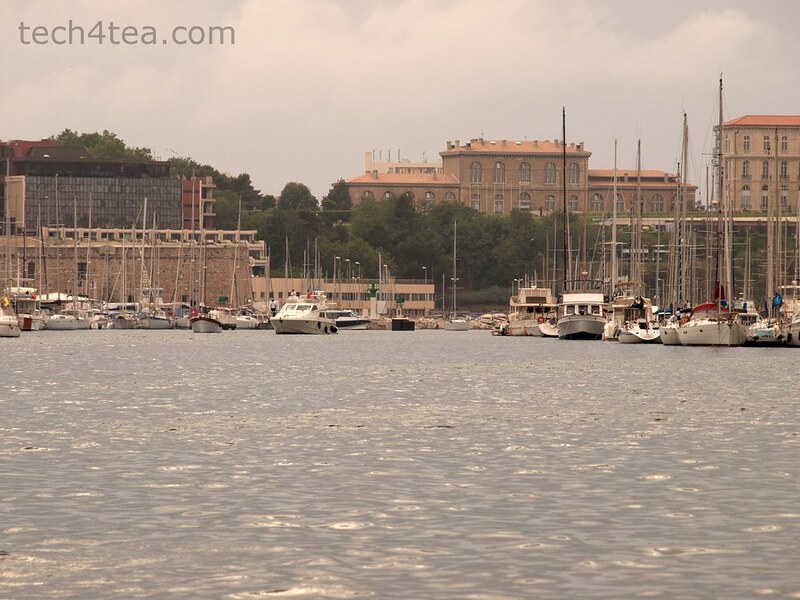 Pict 1: The port of Marseilles in Southern France on an overcast evening. Pict 2: The overall contrast and brightness has been increased with the Levels command. Most free and basic photo editors offer a basic Brightness/Contrast command that allows the user to easily adjust the brightness and contrast of a photo. GIMP tool also has the equivalent in the Colors > Brightness-Contrast command from the main menu. This basic adjustment command uses a rudimentary algorithm that treats all pixels equally and adjusts them to the same extent. 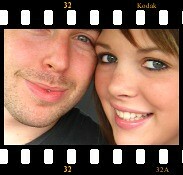 It’s useful if all you need is a quick and dirty adjustment to the photo. For almost the same effort, the Levels command provides better control and the algorithm yields better results adjusting pixels to different extents depending on the settings you make. That is why for many free photo editors, more advanced tools like the Levels and Curves command are not available or are only available when you upgrade to a paid version. In GIMP, these tools available for free. Pict 3: This photo of a hanging potted plant is slightly underexposed because the camera has been fooled by the bright background. Pict 4: The red petals are now more vibrant and discernible after the photo has been enhanced with the Levels command in GIMP. Last week, we looked at how to analyse a photo’s characteristics and problems by examining its histogram in GIMP. Using the histogram as a basis, we’ll learn to use the Levels command to improve the tonal distribution of a photo such that the overall brightness and contrast of the photo is just right and the entire range of brightness values (from 0 to 255) available is fully utilised. With the photo open in GIMP, choose the Colors > Levels command from the main menu. 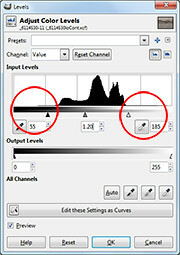 A complicated looking Levels dialog box pops up showing a histogram of the photo as well as many controls and input fields to control the histogram is to be adjusted. The reason why many beginners hesitate to use the Levels command is the seeming complexity of the dialog box. But in most cases, all you need is to drag one to three of the triangular sliders directly below the histogram. Here’s how. Pict 5: Busy bee working on Lavender flowers in Provence, south of France. Pict 6: The photo after darkening using the Levels command in GIMP. For the slightly overexposed photo of the lavender flowers, the histogram shows that none of the brightness values below 60 is utilised. 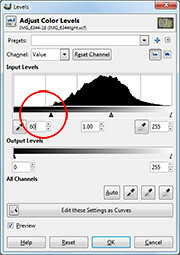 Drag the blackpoint triangular slider from the left edge inwards towards the right until it is at the point where the main bulk of the histogram starts to form (see Pictures 5 to 7). Pict 7: Drag the triangular slider from the left edge inwards towards the right. 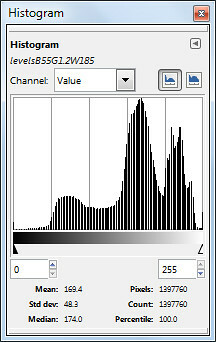 The three boxes below the histogram shows the numeric brightness values of where the sliders are. It serves as a reference or when you need to key in specific numeric values to use. Most of the time, you should simply drag the slider inwards based on where the bulk of the histogram begins. Dragging the blackpoint slider to 60 tells GIMP to darken pixels of brightness 60 and below down to zero. The other pixels in the histogram are correspondingly darkened as well. This also increases the overall contrast of the photo because a wider range of brightness value is now used in the photo. To further finetune the brightness of the photo, drag the centre slider to the left or right to lighten or darken the mid-tones. Pict 8: Drag the triangular slider from the right edge inwards towards the left. 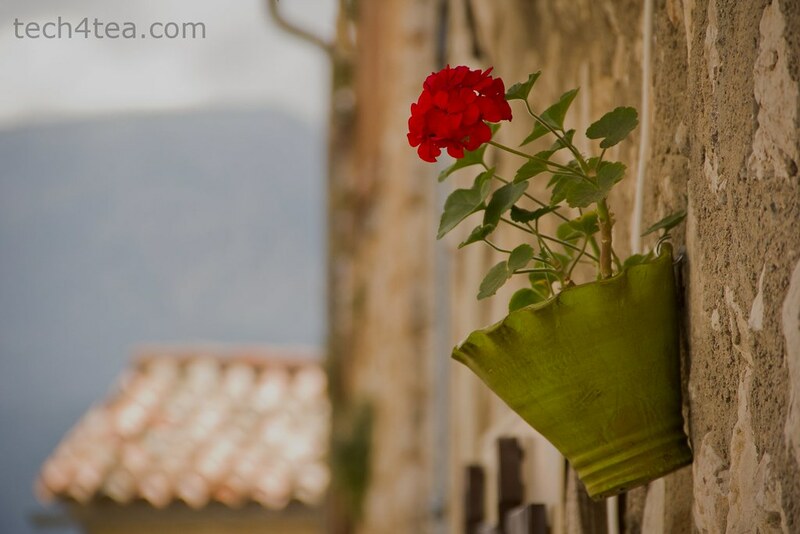 For the slightly underexposed photo of the potted flower on the wall, the histogram stops short at around the brightness level 210. 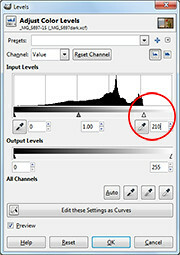 Drag the whitepoint triangular slider from the right edge inwards towards the left until it is at the point where the main bulk of the histogram ends (see Pictures 3, 4 and 8 ). Dragging the whitepoint slider to 210 tells GIMP to set 210 as the white point – all pixels that are of brightness 210 and greater are increased to the maximum of 255. The other pixels are correspondingly lightened as well. As before, the overall contrast of the photo is increased because the entire range of brightness values is now used in the photo. Again, drag the centre slider to the left or right to lighten or darken the mid-tones further. The snapshot of the port of Marseilles was taken on an overcast evening and is not only too dark but sorely lacking in contrast, resulting in a dull and flat photo (See Pictures 1 & 2). Pict 10: The histogram is now spread across the entire range of brightness. The histogram in the Levels dialog box shows that all the pixels are bunched up in the mid-tones – there are now extreme white or black pixels – so the highlights are not bright enough while the shadows are not dark enough. Pict 9: Drag the blackpoint and whitepoint triangular sliders from both edges inwards. In this case, drag the blackpoint and whitepoint sliders inwards to where the bulk of the histogram begins and ends (see Picture 9). This darkens the shadows and lightens the highlights forcing the bunched up histogram to spread out across the entire range of brightness – thereby increasing the overall contrast of the photo. 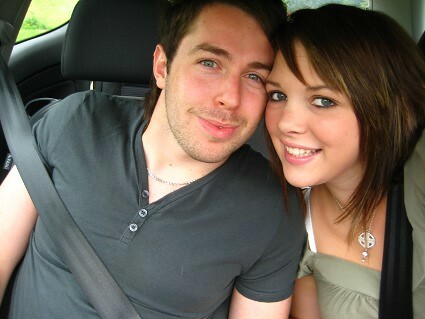 As the photo is still too dark, drag the centre slider to the left to further brighten the photo. 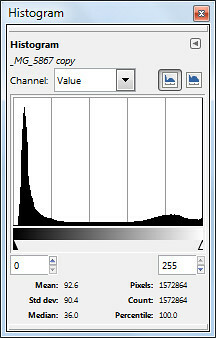 The resulting histogram after the adjustment is now spread out across the entire brightness range (see Picture 10). The histogram of a photograph tells you whether a photo is too bright, too dark or too flat and lacking in contrast. It forms the basis of more advanced and powerful tools – such as Levels and Curves – to enhance the brightness and contrast of a photo. 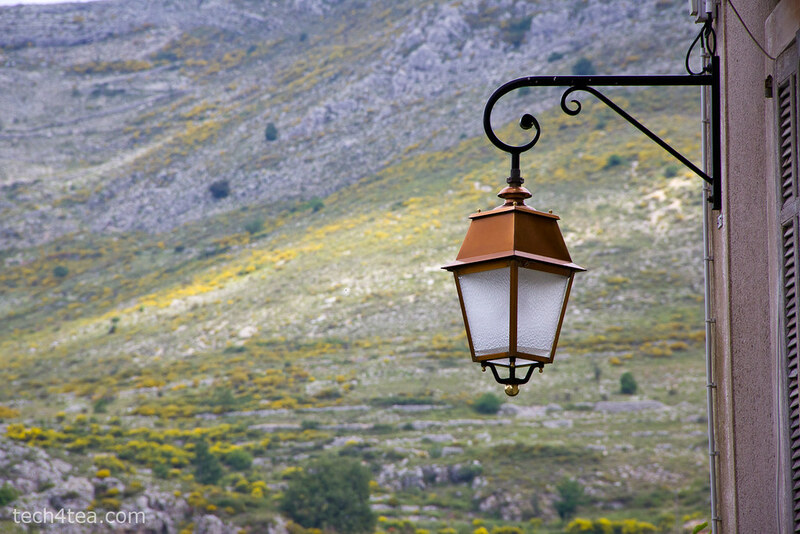 Pict 1: Metalwork lantern in French Provence. 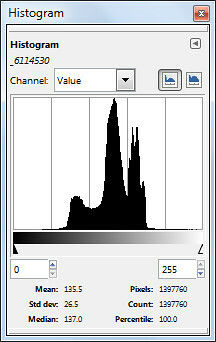 Exposure was well-balanced, as indicated by the histogram below. Many digital cameras today can display histograms on their LCD screens in both the review and preview modes. The histogram helps the photographer to assess whether the exposure settings for an image are optimal. This is most useful when bright sunlight makes it difficult to judge – just by viewing the photo preview/review on the LCD screen – whether a photo is too bright or dark. If the histogram indicates that the photo is too dark or bright, the photographer can adjust the exposure settings to get a better shot. 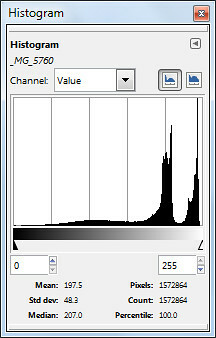 Pict 2: Different parts of a histogram. The photo of the metal work lantern was well-exposed. The histogram is basically a graph of the brightness levels of all the pixels in a photograph – from pure black (brightness value zero) on the left edge to pure white (brightness value 255) on the right edge. Pict 4: An overexposed photo has its histogram bunched up to the right. 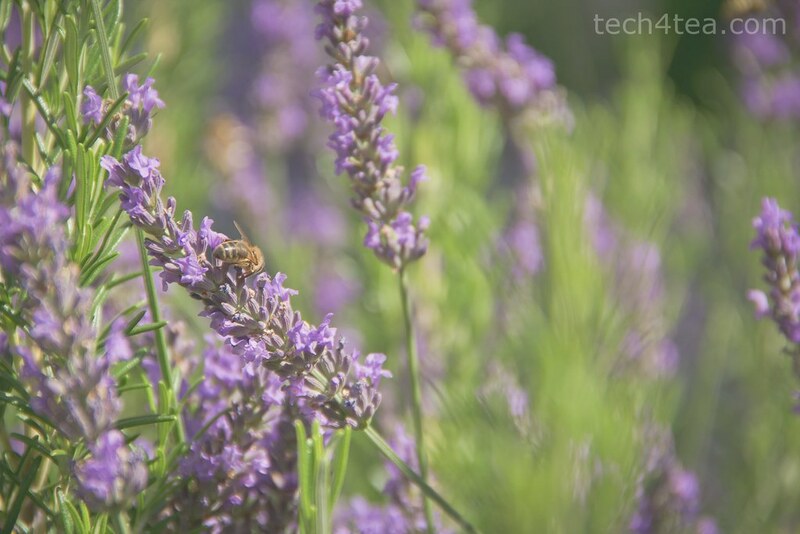 Pict 3: Lavenders in the French Riviera - overexposed. The number of pixels in each of the 256 levels of brightness are counted and plotted on the Y axis as a bar chart to provide an idea of the tonal distribution of a photograph and its possible problems. 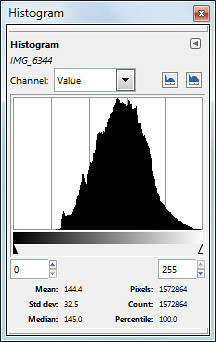 The region around the left edge of the histogram represents the shadows (dark tones) in the photo while the pixels near the right edge represents the highlights (bright tones). The middle region represents the midtones. When a photo is opened in GIMP, you can view the photo’s histogram by selecting the Windows > Dockable Dialogs > Histogram command from the main menu. By analysing the histogram, you can better decide how to use the tools in GIMP to enhance a photo’s brightness and contrast. Pict 5: Flowers at Gourdon - underexposed. Pict 6: Port of Marseille on a dull and overcast day. Pict 7: All bunched up in the middle - suggesting a photo with poor contrast. A well-exposed photo usually has a histogram which looks like a bell-shape and which stretches from one end of the histogram to the other (see Pictures 1 & 2). A photo that is overexposed (too bright) usually has a histogram that is bunched up on the right, while an underexposed photo will have a histogram that’s bunched up to the left (see Pictures 3 to 5). A photo with poor contrast will usually have a histogram that is squashed up towards the middle. The photo appears dull and flat. The brightest pixels are not bright enough while the darkest pixels are not dark enough (see Pictures 6 & 7). Note that there are exceptions under special photographic situations. For example, a photo that comprises mainly bright tones (such a scene comprising white snow against a light coloured sky) can have a histogram that is bunched up to the right, even though it is properly exposed (see Pictures 8 & 10). 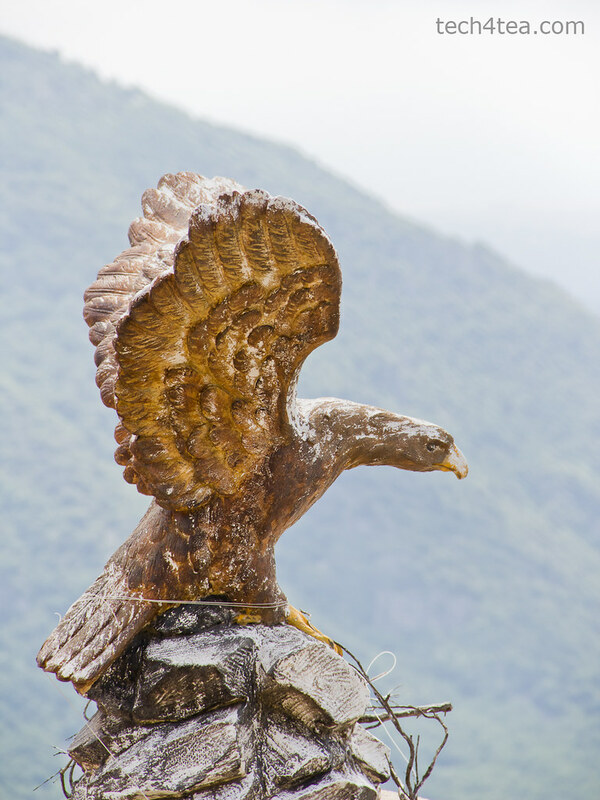 Pict 8: Eagle perched atop Gourdon. 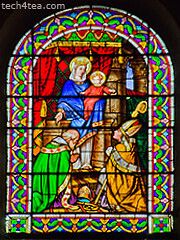 Pict 9: Stained glass window in Provencal church. Similarly, a photo consisting of predominantly dark tones can have a histogram that is bunched up on the left – even when properly exposed (see Pictures 9 & 11). Pict 10: Bunching up to the right caused by bright background behind the eagle despite proper exposure. Pict 11: Histogram is bunched up because of the predominance of dark tones - despite proper exposure. In the next installment, we’ll use the Levels command to enhance a photo’s brightness andcontrast based on the characteristics of its histogram. Layers and layer masks are what differentiates a powerful image editor like GIMP from a basic photo editor. Design a poster for your living room from your favourite photo. Make a poster or postcard from your favourite photo. Ever wanted to make a postcard or a poster from your favourite photo? Here are some techniques using layers and layer masks in GIMP. Open the photo in GIMP. From the Layers dialog, you can see it resides in the Background layer which is the only layer for the moment. The original photo from morguefile.com. A grid of white dots is overlaid onto the photo. Add a new layer by clicking the icon at the bottom left corner of the Layers dialog. In the “New Layer” dialog box that pops up, select the radio button for “White” option under Layer Fill Type and press the OK button. A new empty layer filled with white is added above the original photo in the Background layer. Right-click on its thumbnail in the Layers dialog and select “Add Layer Mask” command from the pop-up menu. In the “Add Layer Mask” dialog box that pops up, select the “White (full opacity)” option and press the OK button. A layer mask filled with white is added to the layer – you can see its thumbnail beside the original thumbnail in the Layers dialog. Use the Grid filter to create the grid of white dots. From the main menu, select the “Filters > Render > Pattern > Grid” command. 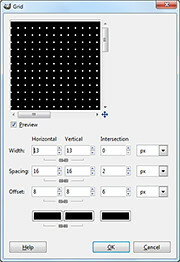 In the Grid dialog box that pops up, increase the horizontal width setting until the preview in the dialog box shows a grid of white dots of the desired size. Here I used a setting of 13. The white layer now appears as a grid of white dots overlaid on the original photo. Right-click on the upper layer in the Layers dialog and select “Apply Layer Mask” to merge the layer mask into the original solid white layer. 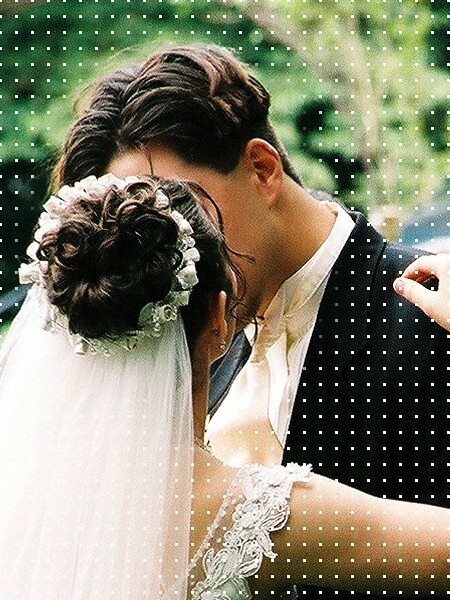 The layer mask is removed and the layer becomes a transparent layer with a grid of white dots overlaid on the photo below. Use a layer mask to hide the white dots from the heads. Add a new layer mask on this layer, again selecting the “White (full opacity)” option in the “Add Layer Mask” pop-up dialog box. Press “D” on the keyboard to reset the Foreground colour to black. Activate the Paintbrush Tool from the Toolbox and paint on the layer mask in the image window. Paint around the heads and faces of the wedding couple to hide the white dots in that area. From the main menu, select the “Layer > New from Visible” command to create a new layer that combines all the visible layers in one layer. 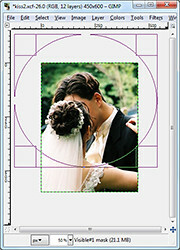 In the Layers dialog, click to select the layer below the new combined layer. This is so that any new layers created will be added BELOW the combined layer. Zoom out until the photo is smaller than the image window. Set the Foreground colour to green (or your preferred colour). Add a new layer by clicking the icon at the bottom left corner of the Layers dialog. In the “New Layer” dialog box that pops up, select the radio button for “Foreground color” option under Layer Fill Type and press the OK button. A new layer filled with green is added just below the combined layer. Right-click the combined layer in the Layers dialog to add a layer mask to the layer, using the “White (full opacity)” option. Press the minus key (“-”) on the keyboard to zoom out the view in the image window. As the photo becomes smaller than the image window, you will see white space between the edges of the photo and the edges of the image window. Adding a green arc at the bottom of the poster. Activate the Ellipse Select Tool from the Toolbox and drag an elliptical selection around the couple’s heads. You can begin dragging in the white space between the photo and the edge of the image window so that the elliptical selection covers most of the photo except for a small arc at the bottom of the photo. Remember you can adjust the size and position of the elliptical selection by dragging the side or corner control handles of the selection outline. Once happy with the selection, use the “Select > Invert” command from the main menu to invert the selection. Press “D” on the keyboard to reset the Foreground colour to black. Select the “Edit > Fill with FG Color” command to fill the arc with black (in the layer mask). An arc of green is revealed below the photo. Click on the green layer in the Layers dialog to select it. Add a white highlight band in the green arc. Add another new layer, this time selecting the radio button for “White” option under Layer Fill Type. The new white layer is added above the green layer but below the combined layer. Add a layer mask to the white layer, selecting the “Black (full transparency)” option in the pop-up dialog box. A layer mask filled with black is added to the layer. Press “D” to reset the Background colour to white. Using the Rectangle Select Tool from the Toolbox, select a vertical band and use the “Edit > Fill with BG Color” command from the main menu. A white band is added to the layer mask such that a white band runs through the green arc. Click the combined layer (the topmost layer) in the Layers dialog to select it, so that any text captions added will be added above it. Activate the Text Tool from the Toolbox. In the Tool Options below the Toolbox, set the font, size and colour settings for the Text Tool. 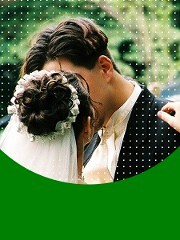 Click in the white band in the arc with the cursor and type the word “Wedding”. Click in the green portion to add the word “Kiss”. After adding the captions, you can still change the font, size and colour setting for these captions by selecting them first with the Text Tool and then modifying them in the Tool Options. Add a new empty layer right at the top of all other layers. Activate the Blend Tool from the Toolbox. Press “D” to reset the Foreground colour to black and the gradient to “FG to Transparent”. Again, zoom out the photo (by pressing the minus key on the keyboard) until the photo is smaller than the image window. Drag a black-to-transparent gradient from outside the right edge of the photo (but inside the right edge of the image window) to slightly inside the right edge of the photo. Save the file in .xcf format so that you can come back to tweak the design in the future. Save as .jpg to send the file for print at the studio.